I was at Capricon 34 this weekend here in Chicago and dropped by Greg Ketter’s booth in the Dealer’s Room. Greg is a great guy, owner of DreamHaven Books in Minneapolis, one of the last great science fiction bookstores. I’m pretty sure I was in the middle of a conversation with someone when I saw three boxes peeking under from under his booth with a hand-written “$1” sign. Next thing I know, I’m sitting on the floor, surrounded by neat little stacks of books on the carpet. There’s nothing like finding a book you’ve always wanted in a dollar bin. Except maybe finding a treasure you didn’t even know existed. 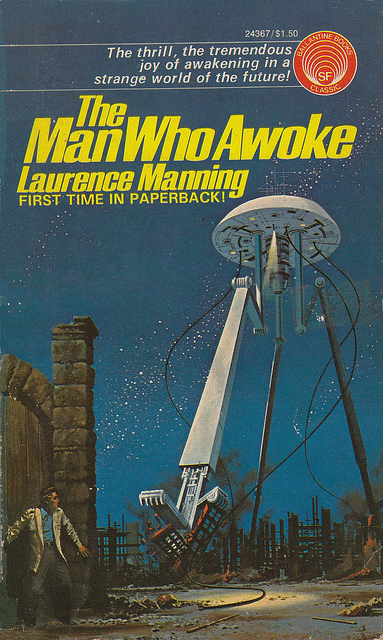 And that’s what happened when I pulled out a pristine copy of Laurence Manning’s 1975 paperback The Man Who Awoke from the bottom of the box. The Man Who Awoke is a collection of five novelettes originally published in Wonder Stories in 1933. It follows the adventures of Norman Winters, a scientist who finds a way to put himself into suspended animation and wake up every 5,000 years. He encounters vastly changed human civilizations at every stop, until he awakens one last time in the year 25,000 A.D. I read the first story in the pages of that pinnacle of Western Modern Literature, Isaac Asimov’s pulp anthology Before the Golden Age, and really enjoyed it. Winters awakens in 5,000 A.D. to find the city of New York gone, and in its place a thick forest — and humanity struggling to survive. It was a rip-snortin’ slice of pulp escapism… or was it? Norman Winters encountered a society that resented the consumption of coal and oil in reckless profusion by their ancestors and that lived in a stringently cycled economy made necessary, in part, by ancestral waste. In the 1970s, everyone is aware of, and achingly involved in, the energy crisis. 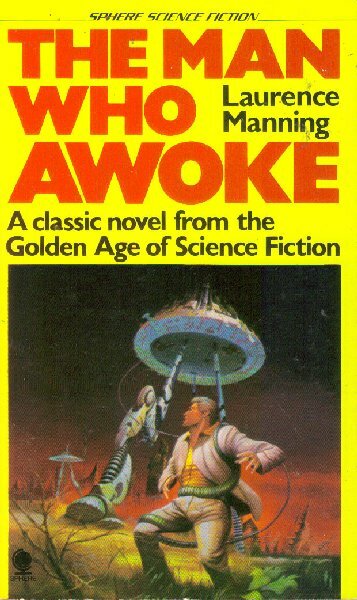 Manning was aware of it forty years ago, and because he was, I was, and so, I’m sure, were many thoughtful young science fiction readers. It was a funny kind of escape literature that had the youngsters who read it concerned about the consequences of the waste of fossil fuels forty years before all the self-styled normal and sensible human beings felt it necessary to become interested. Each of Winters’s leaps into the future were covered in a separate story — and each addressed the consequences of some social ill, from rampant consumerism to blindly following strong leaders. I’ve been waiting to read the next installments in the series since I thrilled to the first one, 25 years ago. Before the Golden Age, of course, was a considerable success, and I like to think it was that success that led Del Rey to reprint the entire series in paperback a year later. Norman Winters slept soundly. Five thousand years at a time. But what worlds did he wake to? Humanity staggers to save itself amid the world’s littered, stagnant wreckage after what has become known as the great Age of Waste. The world is dominated by the Brain — the inexorable machine that knows all, sees all, and feels nothing. A life so unbearable to face that humans program their choice of dreams and sleep their lives away! After the Age of Freedom came an Age of License. And after that, the terrifying Age of Anarchy. At last, humanity discovers the secret sought through the centuries — but what price glory? How pristine was this copy of the book? The instant I opened it, the 1975 tip-in brochure for the Science Fiction Book Club fell into my hands, crisp and new as the day it was printed. No one has opened this book in nearly 40 years, and it shows. I was more than happy to hand Greg a buck for it, believe me. Manning was a Canadian author who died in 1972. He wrote very little else of consequence in the genre — a handful of short stories and one short novel, The Wreck of the Asteroid, which was also serialized in three parts in Wonder Stories in 1933, but never reprinted. He was a founding member of the American Rocket Society and is recognized today by the Smithsonian’s National Air and Space Museum as an early pioneer in rocketry. The Man Who Awoke was published by Del Rey Books in 1975. It is 170 pages in paperback, priced at $1.50. The cover is by Dean Ellis. It has never been reprinted and there is no digital edition. 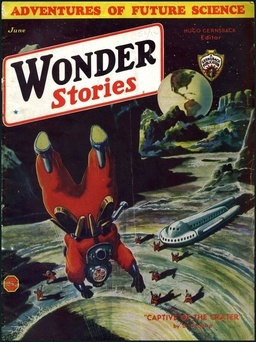 There was a British edition from Sphere (cover left) in 1977. See all of our recent Vintage Treasures here — and see all of our recent coverage of Pulp fiction here. I read this very edition around 1981 or 1982. For some reason it’s been on my mind a lot lately (no, I have no idea why), and I’ve been thinking of reviewing it on my science fiction blog. I’d be interested in knowing your thoughts on the book, John. A nice little riposte to the charge of escapism from Asimov there — thanks for reprinting it! Manning’s book sounds like it has a marvelous premise. I ownthe Asimov anthology, but this is one of the stories I haven’t yet read. Sounds like I should remedy that! > I’ve been thinking of reviewing it on my science fiction blog. You’re more than welcome to review it for Black Gate, if you’re interested. Yes, it’s more SF than pure fantasy, but it falls nicely under the Pulp umbrella, and we’re not too picky when it comes to pulp adventure fantasy. > I’d be interested in knowing your thoughts on the book, John. I remember I used to get this story confused with Neil R. Jones’ “The Jameson Satellite” (which is also about a scientist who freezes himself and awakens in a far future Earth, and I also read around the same time in BEFORE THE GOLDEN AGE), so I should probably start by re-reading the original story. Isn’t it? Although I was a little surprised to hear him sound so defensive. As perhaps the leading popularizer of science fiction in the late 20th Century, you’d think he’d be able to say it without coming off quite so much as a typical teen reader, whining about normal people. > Sounds like I should remedy that! Indeed — and the sooner the better! Thanks, John. I may take you up on that offer. And since you mention C. L. Moore, I need get back to my posts on Northwest Smith. I started a series about a year ago and stopped when I got to “Werewoman” which she wrote in collaboration with Forrest J. Ackerman. Ackerman wrote about their collaborations in one of his books, and the book disappeared in the most recent move. I finally found it, and one of my goals for the year was to restart the series. I’m looking forward to your thoughts on Moore. Believe it or not, I’ve never read a Northwest Smith story (!). I’ve been covering Lester Del Rey’s THE BEST OF… volumes for the last few months, and the next one on the list is THE BEST OF C.L. MOORE. I was fairly sure I’d read it — but of course, the moment I opened it and started reading, none of it was familiar. Is it possible I somehow missed this one in my youth? One of the rewards of doing a survey of your early reading later in life… you discover holes you didn’t know existed. Glad you found that Ackerman book! The Northwest Smith stories are…interesting. There’s a lot of sexual imagery in the early ones. I picked up on some of it when I was a teenager, but upon rereading in middle age, all I can say is “Wow!” I hope to have a new post in that series up soon.